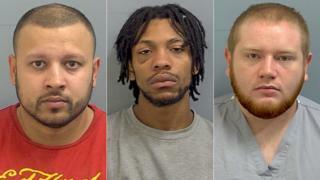 Three men who murdered a drug dealer in front of his girlfriend in a "merciless attack" have been jailed for life. Przemyslaw Golimowski, 30, was stabbed and beaten with a golf club at his flat in St Mary's Street, Bedford, on 28 September. Taleb Hussain, Delpierro Mothersill and Damien Rooney were given minimum terms of 26 years, at Luton Crown Court. Two other men were cleared of murder but found guilty of manslaughter. Both were jailed for 12 years. The trial heard Mr Golimowski was attacked the day after he stole drugs and cash from Delpierro Mothersill. The 30-year-old and another man had struck Mothersill repeatedly with a pool cue. This led to Mothersill, 20, launching a "mission of revenge". He and four other men entered Mr Golimowski's flat in the early hours of 28 September. Mr Golimowski's girlfriend Anna Swierczynska told the jury three men attacked her boyfriend with knives. "They kept attacking him, they wouldn't give up. There was blood all over, it was everywhere," she said. One stab wound went through Mr Golimowski's ribs into his heart, another into his liver and a third into his stomach. The prosecutor said the attack, which left Mr Golimowski with 56 injuries, lasted for five minutes. Judge Richard Foster described the killing as a "pre-planned merciless revenge attack". Sentencing the men, Judge Foster said: "It is yet another example of toxic mix of drugs and knife crime in a town beset with such problems." Jamal Jeng, 21, of The Close, Clapham, south London, and Philip Mendy, 23, of Russet Close, Bedford, were convicted of manslaughter.